I just added this sweet summer clutch pattern, the Picnic Purse, to my Ravelry Store and Etsy Shop. In case you couldn’t tell, this design was inspired by summer picnics. One of the things I loved about living in NY was going to central park and lazing about with friends for a potluck picnic! It’s just getting warm enough to do that in Bozeman, too. The yarn I used (Cascade 220 Heathers) reminded me of a picnic basket and I used some silky stash yarn to add the extra summery flowers. The pdf is a whopping 8 pages long and includes step by step photos for lining the bag and inserting the zipper. I’m not fond of knit/crochet bags without a lining and closure (unless they are totes) so I wanted to include all of that information for interested parties. I had some wonderful pattern testers this time around, and if you’re on Ravelry you can see their variations on the Project Page. I thought it was extra cool how international my testing team was- I had a tester each from Canada, Sweden, India and the USA. I love the internet!! 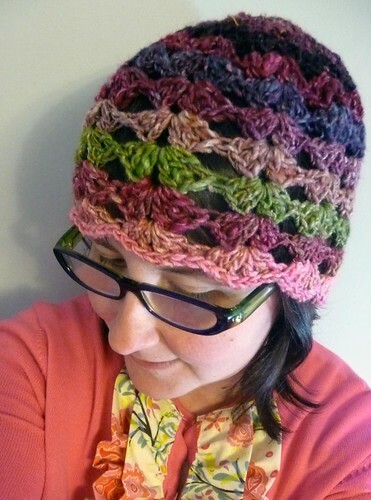 I also wanted to show you this rendition I made with my Lacy Shells Hat Pattern. I squeaked it out with one skein (109 yds) of Noro Silk Garden. I love how it worked up and contrary to what I thought, the yarn does seem bearable to wear (and I’m a no-itch snob!). I’ll be teaching this pattern in my beginning crochet class at the yarn shop, if any locals are interested. I have a couple more finished projects to show you this week. 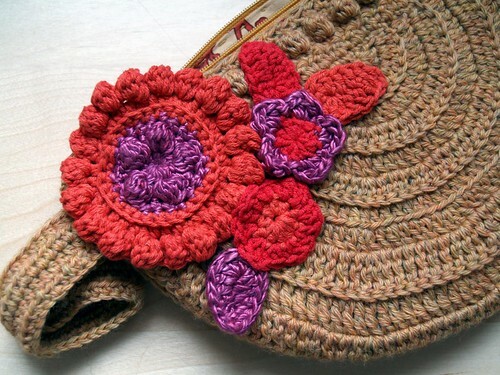 It seems that all of a sudden this has turned into a bona fide crochet blog! I’m still trying to think of my next crochet project, but don’t worry, I still sew buy fabric. I struggle with wanting to design more patterns and wanting something totally mindless. It’s important to me to balance designing with making things from other people’s patterns so I can still keep my “hobbies”, see. There are so many more wonderful crochet patterns now than there were even a few years ago, and I can’t help but try them out. Such cute projects you are making! I know what you mean about balancing the job part and the hobby part. Sounds like you're doing it and having fun too.